The all-new Maserati Quattroporte will be released in Australian during January 2014. The first variant to arrive is the Quattroporte GTS, which will top the range of Maserati's large saloon. The new Quattroporte has a new and unique to Maserati platform and, also, a new engine range developed specifically for Maserati, along with a new variant of the ZF eight speed gearbox. The suspension, the brakes, the interior are all new, as is its body that blends aluminium and steel for strength and lightness. As the flagship of the Maserati range, the new Quattroporte is larger, lighter, more luxurious and more practical than the car it replaces. It will compete against Next Car's favourite large saloon the Jaguar XJ, together with a few other expensive prestige sedans. The sixth-generation Quattroporte remains faithful in style, design and sound to Maserati’s long history of luxury saloons. The powerful Maserati engines and the large cabin are at the core of the Quattroporte’s design. Dominated by a long, powerful 'nose' and a concave Trident grille a clear link is made to the outgoing Quattroporte. The Quattroporte debuts a newly-developed direct-injection engine range that opens with a 3.8-litre V8 which is twin-turbocharged, designed and developed by Maserati Powertrain and assembled by Ferrari at its Maranello factory. It is matched to the latest eight-speed automatic transmission developed with ZF to meet the needs of the new engine range. Even with all of its new technology, the new Quattroporte remains true to Maserati’s past. Its 390 kW twin turbo V8 makes it not only the fastest four-door Maserati has ever built, but also the most powerful and the most fuel efficient. In direct contrast to its scintillating performance, the V8 Maserati Quattroporte has improved both its fuel consumption and emissions by 20 per cent over the outgoing Quattroporte. The 3.8-litre V8 engine sets Maserati’s new performance benchmark by reaching 100 km/h in 4.7 seconds. The new Quattroporte has an all new-body that is built around a new platform specifically designed by Maserati that meets the needs of not just the new Quattroporte, but also the Ghibli sedan and Levante SUV models that will follow. This all-new architecture retains the Quattroporte’s handling qualities thanks to its near 50:50 weight distribution, new double-wishbone front suspension and new state-of-the-art five-link rear suspension. The new Quattroporte also delivers new standards in quality in every area from design, development, fabrication and process controls. It is produced in a new plant that combines Maserati’s traditions of craftsmanship with cutting-edge technologies that are able to help guarantee quality by controlling even the tiniest of details. Traditional hand-crafted design continues in the Quattroporte’s cabin, and this has been augmented with even more interior space in all seats and both four- and five-seat lay-outs. Cabin luxury leaps forward technically, too, with features like the Maserati Touch Control screen, reverse cameras and the optional 15-speaker, 1280 Watt Bowers & Wilkins audio system, as well as WLAN-based WiFi. The new Quattroporte is the first of a new range of models that will arrive in 2014 which will see Maserati expand its presence into new market sectors. The previous generation Quattroporte was the best-selling Maserati of all time. The Maserati Quattroporte’s transformative effect on the Italian car maker is very clear, not just from the expanded sales but the new customers that it is attracting to the brand. In terms of sales, the demand for the Quattroporte has been unprecedented in the company’s history. Maserati is a particular small volume brand. Total global sales in 2012 was just 6,300 vehicles for the entire range. The brand's best ever year was 2008, when 9,000 Maseratis were delivered to customers. 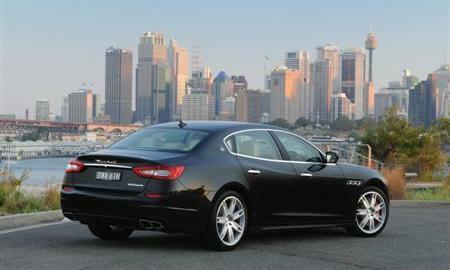 The new Maserati Quattroporte makes its debut in Australia with the top variant, the Quattroporte GTS. This 390 kW Twin Turbo V8 powered super saloon is fully equipped in every area of performance, safety, luxury and technology. Externally it has Chromeline trim that highlights features such as the grille, with its chrome frame and gloss black vertical bars, the side vent ports and around the doors and boot. The headlights are the latest Bi-Xenon headlights that steer, auto dip and have headlight washers, while the rear LED lights provide optimal illumination. Safety features include air bags and a range of electronic chassis controls that improves control. 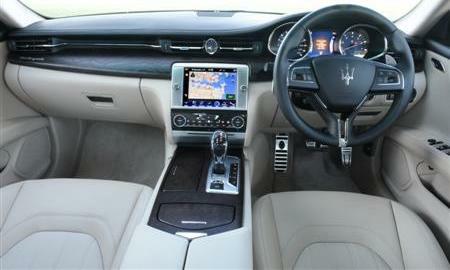 The interior is the perfect blend of the traditional and the new, ranging from the handcrafted leather and wood trim which is set off by the new ambient lighting system, to new technology such as the Maserati Touch Control screen, which controls a range of features but does so in a manner that its well thought out and intuitive. New technology ranges from the complete keyless operation to the car, through to the ‘double glazing’ that cuts both noise and heat, the doors that hold at any angle, not preset points, to active cruise control. Luxury is conferred by the power operated rear and rear side sun blinds, the sophisticated ventilation system and the premium audio system. 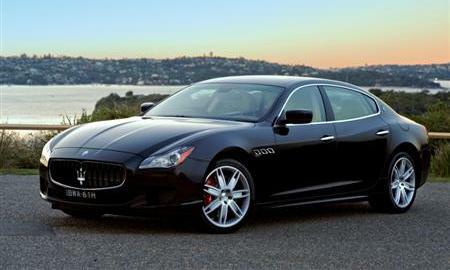 The Maserati Quattroporte GTS has a recommended manufacturer's list price* of $319,800* in Australia.